Are you fed up with tense, explosive meetings? Are you or a colleague targets of a bully? Is your team's performance threatened by rivalries and destructive conflicts? Are your projects needlessly complicated because they had to include superfluous features just to keep peace in your organization? This book is both like and unlike many other collections of ideas for dealing with conflict. Like others, it's packed with ideas and suggestions that will help you deal with destructive conflict once it erupts. Unlike others, it also provides suggestions for changing the way you experience conflict, ideas organizational leaders can use to adjust the organizational culture, and insights that help you understand the systemic sources of conflict. Are you fed up with tense, explosive meetings? Are you or a colleague targets of a bully? Is your team's performance threatened by rivalries and destructive conflicts? Are your projects needlessly complicated because they had to include superfluous features just to keep the peace in your organization? Conflict isn't necessarily bad — it can be constructive, especially when people with opposing views work together to produce a new position that all can support. Often the results are better than any one of the contributors' initial positions. And conflict can be destructive, too, when oppositional, reasoned debate turns to personal attacks, sniping, exclusion, silence, gossip, or worse — violence and other forms of abuse. This tip book shows you how to encourage constructive conflict, how to intervene to end destructive conflict, and how to create an environment that minimizes the occurrence of destructive conflict. In my own experience, and in the course of working with clients in my consulting and coaching practices, I've learned a lot about what works and what doesn't when we try to deal with conflict at work. Some of what I've learned is just good practice and has appeared in the literature over the years. But much is very new, developed in response to the rapid structural and technological change that has swept through today's office. The "personality clash" model of destructive conflict represents some conflicts as arising solely from incompatibilities between two people. Rarely is this the case — the causes of destructive conflict are usually systemic, involving several people, if not everyone, and sometimes people who aren't even present. Bullying behavior is a performance issue that might call for discipline. Tolerating bullying behavior by a subordinate is a performance issue for the supervisor, and it, too, might call for discipline. Tolerating the toleration of bullying behavior on the part of a sub-subordinate is also a performance issue that might call for discipline. And so on. As humans, we repeatedly make the Fundamental Attribution Error — we attribute behavior to character or disposition rather than to situation or context. Consciously try to understand others in terms of the situations they face, rather than their track records, origins, alliances, professions or affiliations. 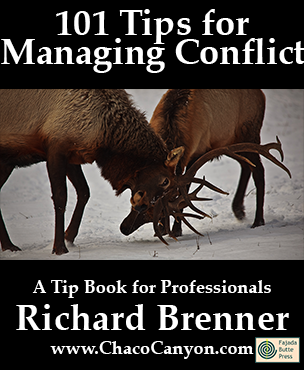 101 Tips for Managing Conflict is in Acrobat format, which gives you several advantages. You can print it, and read it like any book. Or in electronic form, you can use the search capability of Adobe Reader to find passages of special interest to you. If you load it onto your laptop, tablet, or other mobile device, you can read it anywhere — and it's weightless, too. 19 pages.